The expression “scot-free” means to totally escape any penalty, harm, responsibility, or monetary disadvantage normally associated with a given act or situation. In other words, “to beat the rap.” But how do Scots figure into this figure of speech? Is it because our kilt-wearing brethren are better able to dodge what’s due? The “scot” part of this expression is derived from an earlier Scandinavian word for “tax,” which became part of the Old English lexicon courtesy of the Viking invasions of the 9th and 10th centuries. 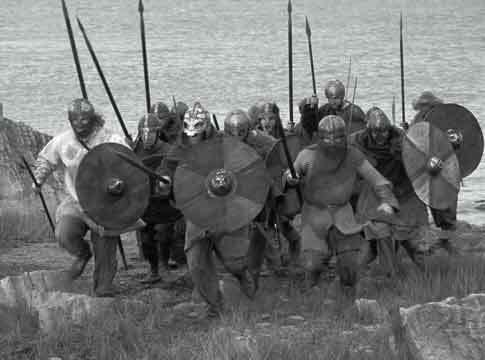 Vikings invade England, rampaging and bringing the word “sceot” or “scot, ”which means “taxes,” with them. Go Ragnor, go! Fast-forward about 300 years and by then, according the printed record, “scot-free” had already assumed the more general meaning it has today. Maybe because of its earlier association with taxation, the phrase “scot-free” gives off a disapproving vibe. No one achieves a state of “scot-free-ness” through the virtues of innocence, honesty, or decent hard work. No, some sneakiness or underhandedness is involved, with maybe some plain old good luck added to the mix. Regarding “scot-free,” I was moved to consider it for this blog of disappearing idioms because it sounded old-fashioned, but even more because I, like a lot of other people, couldn’t even begin to guess where the expression really came from. And when an expression become untethered from the circumstances that produced it, that’s probably a sign that the phrase’s days are numbered. 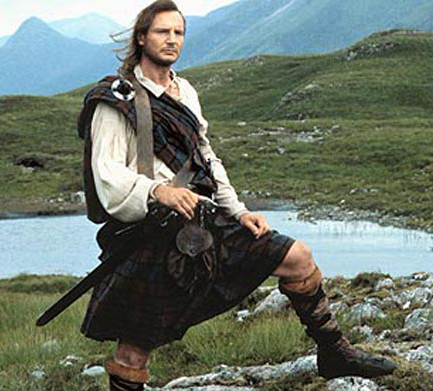 A bonny Liam Neeson as Rob Roy, in the movie Rob Roy (1995,) based on author Sir Walter Scott’s novel of the same name. But I have a theory. Starting around the time of the terrific Scot poet Robert Burns (“My Love is Like A Red, Red Rose”) at the end of the 18th century, and then a decade or so later with the emergence of the wildly popular historical novels of Sir Walter Scott (Ivanhoe, Rob Roy, Kenilworth, and many others), it seemed all of England, as well us here in America, began a re-evaluation of all things Scottish and found a lot to like. With thrillingly romantic movies like Braveheart and Rob Roy keeping the love alive, an ongoing appreciation of and fascination with Scotland continues to this day, as well as an association of Scots with daringness and freedom. And this may account for the longevity of the expression “scot-free” even though it has nothing to do with Scotland. 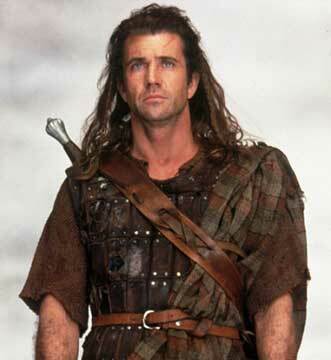 In the epic film “Braveheart” (1995) Mel Gibson portrays William Wallace, a 13th century warrior who fought for Scotland’s independence. Speaking of movies, I have to note the use of “scot-free” in the opening voice-over by a 40-year-old Mattie Ross in the movie True Grit. And with the use of “scot-free,” the reminiscing grown-up Mattie sets up the the whole movie — the sneering underhandedness of the murderer Chaney, the complacency of the townspeople, and the need to rectify their lapse by bringing Chaney to justice. That’s the neat thing about using idioms. They pack a lot of wallop for just a few words. This entry was posted on Monday, April 1st, 2013 at 1:35 pmand is filed under . You can follow any responses to this entry through the RSS 2.0 feed. You can leave a response, or trackback from your own site. I love languages and how they have evolved (and continue to evolve). They are living things, aren’t they? In fact, as much as I love the Internet, I worry sometimes that it will lead to a standardization of language unlike anything accomplished by the printing press. the internet has made the world a whole lot smaller!